It’s the season of good tidings and cheer, but that collective joy doesn’t always happen naturally. For those struggling to make ends meet, it can be a period of extra stress and pressure. But, with some proper planning and a bit of good-hearted time and energy, all can embrace the wonders of the winter holidays. The Waukee Police Department makes time during the days leading up to the major winter holidays to ensure as many people as possible can enjoy the holidays. To accomplish this goal, the 22-person department hosts an annual Thanksgiving Holiday Gift Basket and Shop with a Cop programs. Officer Neil Lemke explained both programs are strictly donation-based and the department welcomes donations from the public. The gift baskets, which are stocked with all the ingredients needed for a nutritious, filling meal, are donation-based, so the number of families helped is dependent on donated funds. Each holiday gift basket costs approximately $30 and is prepared by the local Fareway store. “I’m hoping to set a record number of recipient families this year,” Lemke said. The Christmas-oriented fundraiser, Shop with a Cop, is uniquely individualized for families in need of economic assistance. “The Shop with a Cop Program allows children—also nominated by student counselors in the school district—to buy gifts for their family members,” said Lemke. Children participating in the program start the day with a warm breakfast cooked by the Waukee Fire Department. 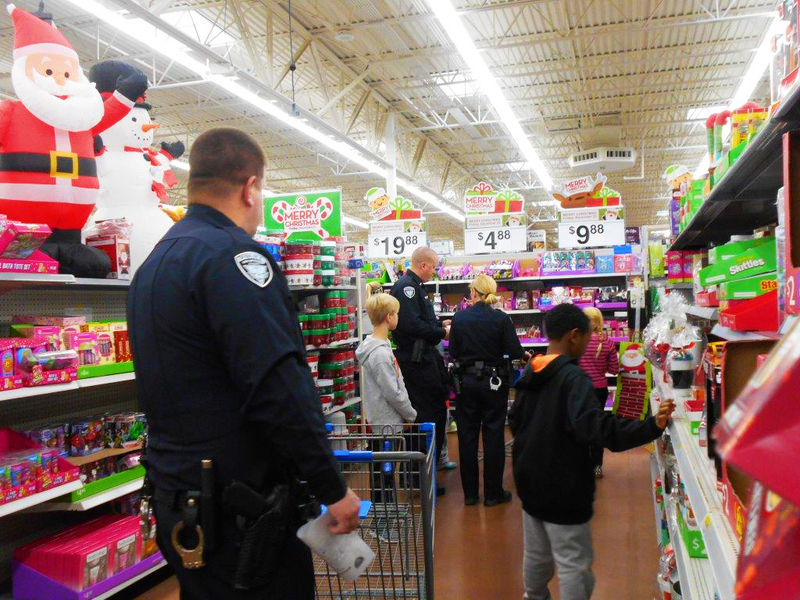 Then, they get to take a ride in a squad car to a store, such as Walmart, to go gift shopping for their families. After shopping, the children enjoy a pizza lunch and wrap their presents at the Waukee Public Safety Building. Lemke said the program typically provides each child with about $100 to spend on their loved ones. Ten families were assisted by the program in 2015. 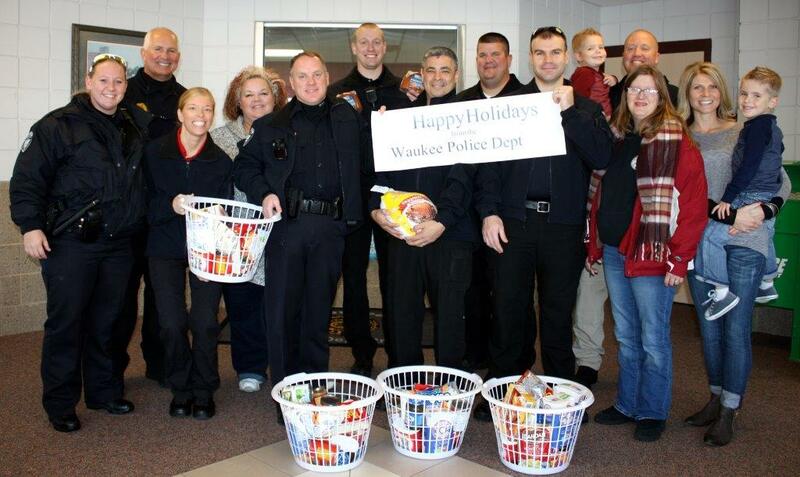 Community service by the Waukee Police Department isn’t restricted to the holiday season. The department is well-versed in community-oriented policing programs, including Safe House, TRIAD, Safety City, Crime-Free Multi-Housing Unit, Neighborhood Watch, Home Alone Camp and Public Safety Day. Lemke explained that Waukee Officers assist with the other ongoing programs in their own time, but the holiday season fundraisers are truly a time for the community—officers, the school district, businesses, and individuals—to work together to make the programs a success. In years past, the Waukee Police Department and Dallas County Sheriff’s Office have run holiday programs jointly, but in recent years, the Waukee Police Department took on their own fundraisers. The Waukee Police Department is happily accepting donations throughout the season. Call the department’s non-emergency phone number, (515) 978-7979, or email police@waukee.org for additional information. Donations are accepted in-person or by mail at the Waukee Public Safety Building located at 1300 SE L.A. Grant Parkway, Waukee, IA 50263.